Need a break from the hustle and bustle of tourist life in Istanbul? Come take an art class with the remarkable Turkish artist our artists ! Our teachers are local Turkish Artisans and have experience in teaching. 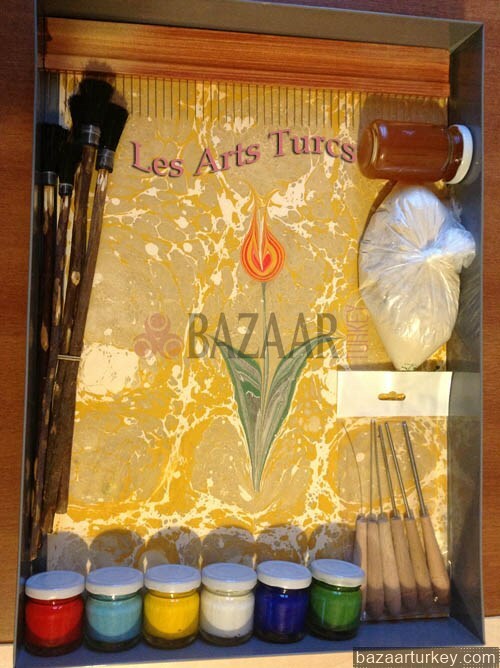 Our Artists are Professional in Marbling - Ebru Art & Local Artisans. Ebru technique consists of sprinkling colours containing a few drops of ox-gall on to the surface of the bath sized withkitre (gum tragacanth) in a trough. By carefully laying the paper over the bath, the floating picture on top of it is readily transferred to the paper; thus, each ebru is a one of a kind print. To obtain beautiful ebru results, one needs to have a light hand, refined taste, and an open mind to the unexpected patterns forming on the water. Patience and a good knowledge of traditional culture are characteristic of ebru masters. After the 1550's, booklovers in Europe prized ebru, which came to be known as ‘Turkish papers’. Many specimens in their collections and in the several album amicorum books are visible today in various museums. Also, early texts dealing withebru, such as “Discourse on decorating paper in the Turkish manner”, published in 1664 by Athanasius Kircher in Rome, helped to disseminate the knowledge of this kind of marbling art. There is agreement amongst scholars that the so-called Turkish Papers played a colourful influence on the book arts in Europe.